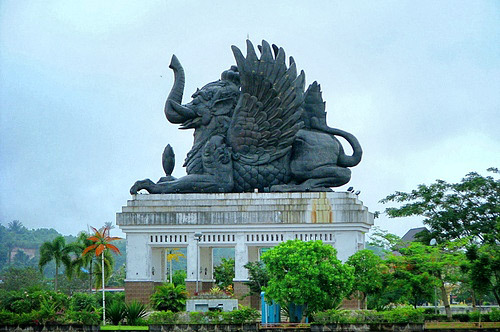 Tenggarong which is located 39 Km in northwest Samarinda during then is capital of Sultanate Kutai. The town is residing in Mahakam riverbank with people about 50 thousand mans; there is ex Kutai Empire, which now functioning as museum. This palace built by Dutch in year 1930 replaces wood building stripper palace that falling to pieces combustible. The Museum has collection of objects from Sultanate Kutai period and Dayak Tribes culture objects. The museum collection is impressing property of stripper ceramics jar of Chinese from dynasty Yuan, Ming and Qing period and now Sultanate Kutai is animated. Every year in September in Tenggarong is performed a Erau Festival that taking place during one finite two weeks. Dayak public who come from various areas in Kalimantan follows this event. At this event is performed custom ceremony and various dances that show by the Dayak dressy custom dancers. Kumala Island is newest tourism object in Kutai with solidarity between traditional and modern with complete facilities.